R J Hill, a prominent Developer in the Central Valley agreed to establish a Water Savings Trial at the entrance to a new housing development in Fowler, CA in 2011. The lot selected for the Trial was at the entrance to the development. Because the intention was to build on this Lot as the Development progressed, the ground was compacted to meet requirements of a future building site. The area was on 2 separate irrigation meters, allowing separate management of the front half (Control Lawn) and back half (Aqua Cents Lawn) irrigation application. Irrigation runtimes, and water savings results, were monitored and validated by CIT, the Center for Irrigation Technology at Fresno State during the 4 Consecutive Years of this Trial, until the R.J. Hill development was “built out,” and required this Entry/Common area for their final home site in 2016. 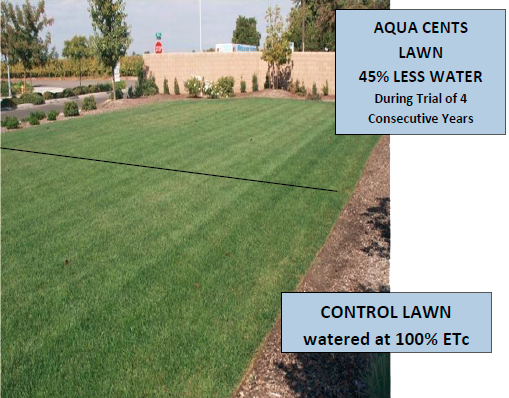 The Control Lawn was watered according to ETc (evapotranspiration requirements for the turf), while the Aqua Cents Lawn was watered at only 45% of ETc, and continued to demonstrate healthy aesthetics and vibrant root growth. Achieved an average 45% water savings during the 4 Consecutive Years of the Trial. “We are committed to conserving water as a matter of practice, drought or not. However, with properties restricted to 2 day/week irrigation schedules, we worked with Aqua Cents Water Management to conduct a Water Savings Trial using their innovative technology as a solution to meet these mandates without permanent risk to the health of the turf on our project and properties. During the 4 years of this development’s build-out, we were able to maintain a healthy lawn at the Entry and Common Area of the Project, while also complying with water restriction mandates. This was especially impressive as it was accomplished on a building site that had been compacted for future use as home site.